Photo gallery: images of the opening night – all photos courtesy of Fiona Laing. Claire Foottit, Camera Voices, Peter West, Scottish Hon Consul for Malawi and Robert Craig, Scottish Football Museum. It was a dream come true – the opening of Livingstone’s Living Legacy: Football and the Three Cs photography exhibition at Hampden Park, the home of Scottish Football, courtesy of the Scottish Football Museum in November 2014. This social documentary photography project was three years in the making (and is still ongoing). It aims to forge links between Scotland and the Southern African countries through which Livingstone travelled, so it was thrilling to have guests from DFID, the Scotland Malawi Partnership, the Big Lottery, Glasgow City Council, Street Soccer Scotland and Seeds of Thought, to name a few. 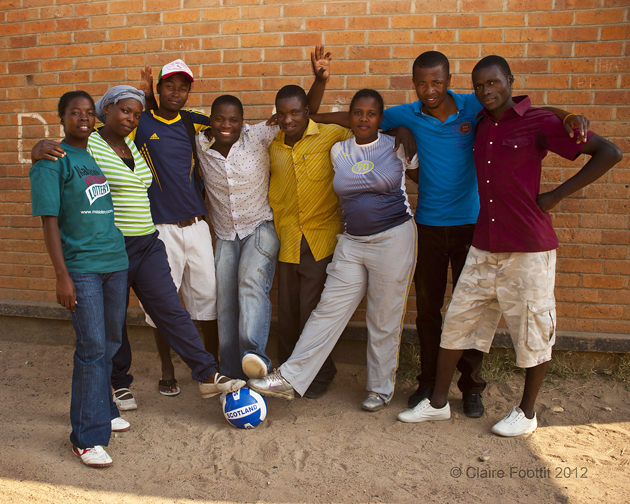 The exhibition focuses on Play Soccer Malawi in Ndirande, Blantyre, the Landirani Trust (African Vision Malawi) near Lilongwe and the Manda Wilderness Community Trust in Mozambique as well as Street Soccer Scotland – all communities that are using football as a vehicle for social change. Claire Foottit, photojournalist and director of Camera Voices, who initiated the project and took the team portraits, gave a universal vote of thanks to everyone who had made the exhibition possible, and especially to Celebrate for the national lottery funding. An African Scottish party was soon underway – enchanting Mbira music played by Tawona Sithole set the tone. The instrument, made from a gourd, has been in his family for five generations. Richard McBrearty, curator at the Scottish Football Museum, took guests on a museum and stadium tour – depicting the fascinating social history which surrounds football – which was much enjoyed. 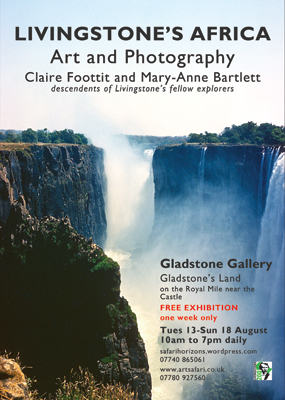 information panels about David Livingstone’s African travels, the Three Cs photography project and the participating organisations. composite photographs compiled from the photographs of the Three Cs taken by the teams on disposable cameras. These give fascinating cultural insights and, importantly, a voice to those whose voices more often go unheard. STV Glasgow sent cameraman Marco Federici along to the exhibition opening. His excellent footage gives the ambience of the evening. It was tremendous to have representation from Street Soccer Scotland – but the other teams – Play Soccer Malawi, the Landirani Trust (African Vision Malawi) and Manda Wilderness Community Trust were not forgotten. Their images of the Three Cs – Christianity and other Religions, Commerce and Culture were much admired and give interesting comparisons between Scottish and African cultures, remembering, of course, that Africa is a continent with 54 countries. The following evening Camera Voices and Street Soccer Scotland were invited to talk about the exhibition on The Riverside Show. No photography is permitted in the studio, but below is the next best thing! 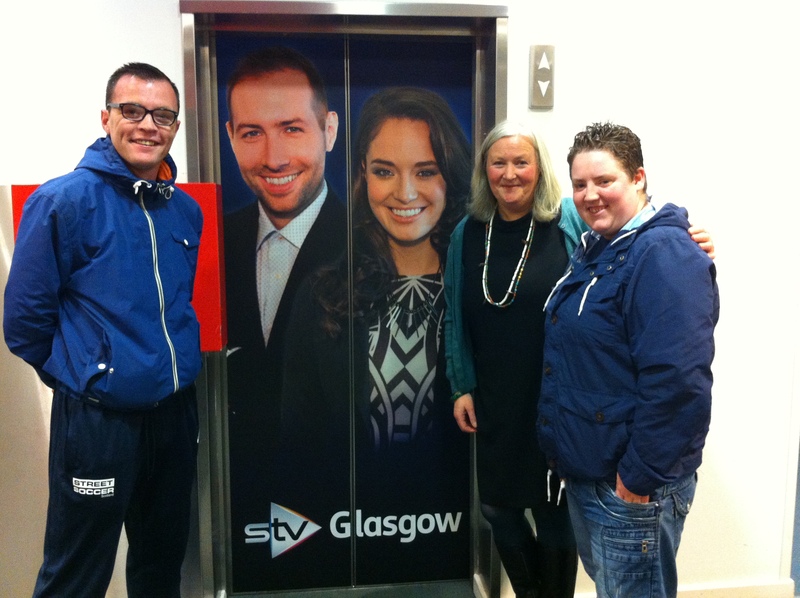 Chris Park (Street Soccer Scotland) Claire Foottit (Camera Voices) and Charlene McKellar (Street Soccer Scotland) after their live TV appearance with David and Jennifer, presenters of STV Glasgow’s The Riverside Show. We were delighted to feature in an excellent article by Hugh Macdonald, chief sports writer at The Herald, who interviewed Claire Foottit about the Livingstone’s Living Legacy: Football and the Three Cs Photography Project. You can read it in The Herald Magazine . The exhibition is on at the Scottish Football Museum, Hampden Park until 22 May 2015, open Mon-Sat 10am-5pm, Sun 11am-5pm (closed during major events) with FREE entry. In the latest Celebrate Awards announced today, Camera Voices is delighted to receive funding to hold Livingstone’s Living Legacy: Football and the Three Cs Photography Exhibition at Hampden Park, Scotland’s National Stadium, Glasgow, in the premises of the Scottish Football Museum in November (dates to be confirmed). The exhibition celebrates Scotland’s heritage with Africa through its most famous missionary explorer, Dr David Livingstone, who is said to have taken a football to Africa. Collaborating with organisations in Africa and Scotland using football for social change, a selection of portraits and images taken by the football teams on disposable cameras will give a modern interpretation of Livingstone’s three Cs, sharing cultural perspectives and enhancing international partnerships. This builds upon the successful trailer exhibition held at the Scottish Storytelling Centre, Edinburgh, in March this year, described as ‘fascinating and very insightful’, which showed work by the Play Soccer Malawi team from Blantyre. A trailer for Livingstone’s Living Legacy: Football and the Three Cs Photography Project exhibition opens today, 19th March 2014, at the Scottish Storytelling Centre, Edinburgh on what would have been Livingstone’s 201st birthday. The Scots Missionary hero was born in Blantyre Scotland, and this exhibition features work from Blantyre in Malawi. Further details on the Events page. It forms a trailer for a major body of work featuring teams from Scotland and Southern Africa for a planned exhibition at Hampden in the Autumn (funding permitting). An exhibition of photographs linked by the thread of Livingstone’s African journeys is on display in the Livingstone Tower at Strathclyde University. It runs from 20 November 2013 to 28 February 2014. At the 20th World Travel Awards held in Nairobi, Kenya, the host nation scooped 15 awards. In the aftermath of the Westgate tragedy, the awards came as a welcome boost, endorsing the quality of Kenya’s tourism product. Kenya’s tourism revenues come second in foreign exchange earnings and tourism provides numerous jobs both within the tourism sector and supporting industries. 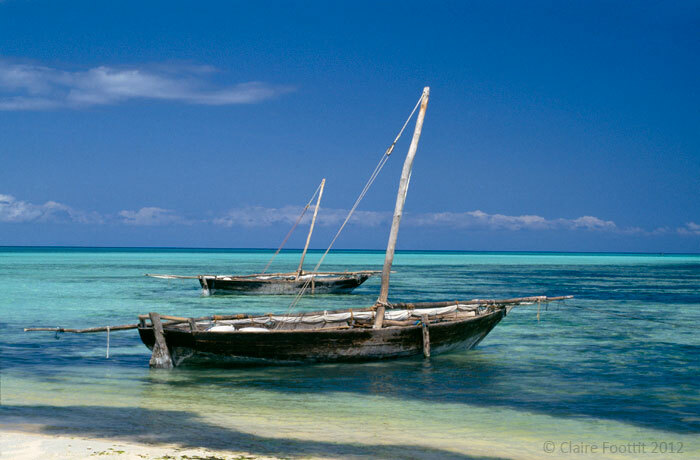 Over the years, Kenya’s tourism has proved resilient to adversity. The industry is working to retain its position as a leading long haul destination as the high season approaches in December. Kenya deserves the world’s support. One of my favourite lodges, I first visited Il Ngwesi in 1995 before it opened to the public. It was the first community owned and managed lodge in Kenya. And its design set a new precedent too with its free-form architecture and open plan rooms under a grass thatch. Since then the lodge has won a plethora of awards, wildlife in the area has increased and revenue derived from tourism has contributed to the local Laikipiak Maasai community. I was enthralled watching an African orange-bellied parrot while looking across to the blue hills of the Mathew’s Range. Going on a camel trek, clouds of white butterflies danced before me with views to Mount Kenya. And at night I heard the distinctive ‘sawing’ sound of a leopard on the prowl. On my next visit I hope to see the pack of wild dogs. 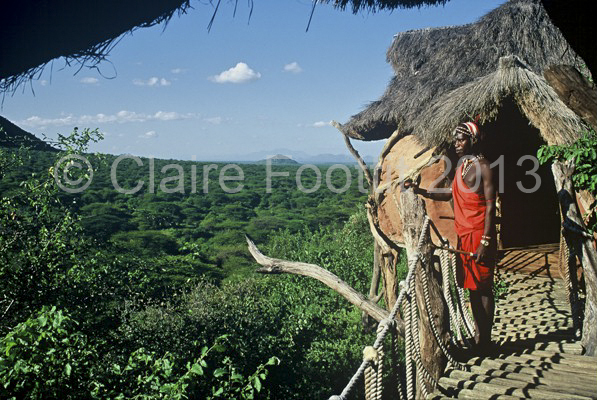 Many moons ago I worked at the Ark, a lodge built on stilts in the Aberdares National Park. Visitors arrived at the Aberdare Country Club for lunch before we headed off in a bus to the salient for an overnight stay at the Ark. This combination is still going. It’s lovely to see that the ACC has retained its traditional character and relaxed setting and that the Ark has had a makeover. The Ark overlooks a salt lick frequented by elephants and buffalo. On the drive through the park, black and white colobus monkeys may be seen in the trees. The ACC is a perfect stop off point between Nairobi and Samburu National Reserve. Having developed from a strong ecotourism base, the Porini Camps are located in the regions of Amboseli and the Masai Mara in community conservancies adjacent to the main parks. They also have a camp in the Ol Pejeta Conservancy. The Amboseli Camp in the Selenkay Conservancy is part of an important wildlife corridor, especially for elephants, connecting with Amboseli National Park. Here, the community has benefitted from tourism revenue and employment while wildlife in the area has increased substantially. All the camps follow a traditional tented style – comfortable without being opulent. They are intimate in size ranging from six to 10 tents. But, most importantly, the guides are excellent, giving a fascinating insight into the flora and fauna, whether on a bush walk or game drive. South Africa carried off the majority of Africa’s World Travel Awards, while other countries featured included Egypt, Morocco, Ethiopia, Tanzania and Mozambique. 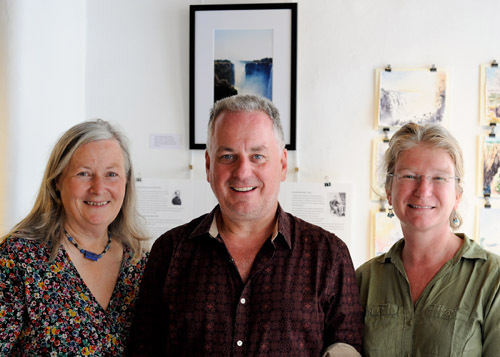 A lovely surprise visit from Jack McConnell at our exhibition yesterday. Take a look at the Livingstone’s Africa Exhibition page for more information.